Young and gay in Russia: How tough is it? Russian President Vladimir Putin said last week that gays “can feel safe” at the Sochi Winter Olympics next month. 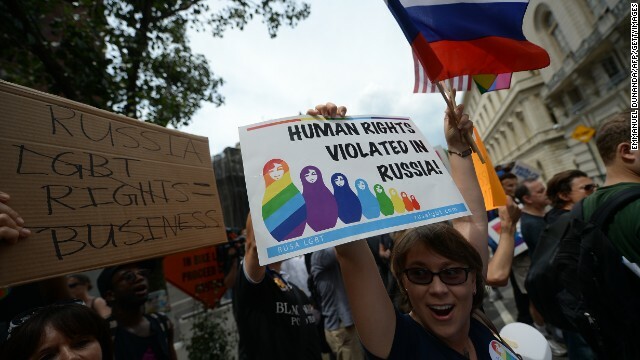 His comments were aimed at easing international concern over the treatment of the LGBT community in Russia following the introduction of a law banning “gay propaganda” and reports of an uptick in attacks against gays there. But what is the situation really like for gay people in Russia? And are things really getting worse? Milene Larsson, contributor to HBO show VICE, has recently returned from Russia where she filmed the documentary “Young and Gay,” and she’ll be answering GPS readers’ questions on the issue. Please leave your questions for her in the comment section below. Sodom issue was started by Jewish, who never obeyed Almighty God's word. Jewish must stop this Satanic practice. GAY IS A TABOO BEFORE THE ALMIGHTY GOD AND HUMANITY. GAY IS OUTRIGHTLY DEVILISH AND COMES FROM THE PIT OF HELL! You just broke the terms of service... You agree not to upload, post or otherwise transmit any User Content that is offensive to the online community, including blatant expressions of bigotry, racism, abusiveness, vulgarity or profanity. People are people no matter what their life style. We all deserve rights. That includes the gay community. @Sampson. No . Actually, being a biggot like you is taboo and morally wrong. I see that these bigots have been carefully taught. In the end, they will lose. In the movie one of the activists says he is against the boycotting of the Olympics because the gays would be blamed and face retaliation. What do you as a foreigner think? What can Americans and Europeans do to help the LGBTQ youth in Russia? Ставки на спорт со 100% гарантией.